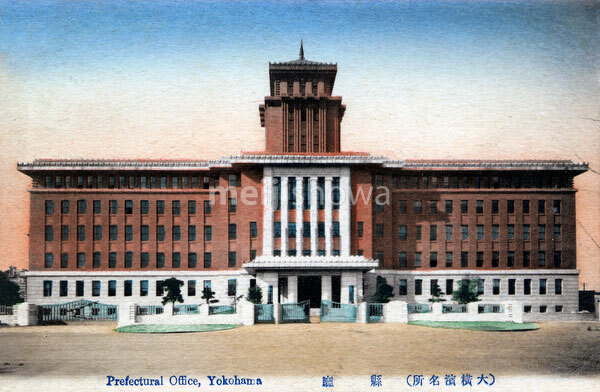 Kanagawa Prefectural Government Office Building (神奈川県庁舎) in Yokohama, Kanagawa Prefecture. Completed in 1928 (Showa 3), the art deco building was designed by Karo Obi (小尾嘉郎, 1898-1974). It is still in use today, the second oldest government building in Japan actually used by a governor. The building is the “King” of the “Three Towers of Yokohama.” It is considered to be the first building using the Imperial Crown Style (Teikan Yoshiki), a mixture of elements from traditional Japanese architecture and bulky western style buildings.